Note: The products below are physical discs that will be mailed to you. The same MP3 lessons that come on the discs can also be downloaded here which does not require shipping. If you are new to the concept of downloading, take a look at our Q&A section for answers to some common questions. These are data DVDs with MP3 audio files on them. Each DVD has all 52 lessons from its respective year on it. If you are unfamiiar with MP3s and/or data DVDs, click here to learn about what they are and how to use them. The special price of $49.99 per collection reflects an extension of our introductory price! 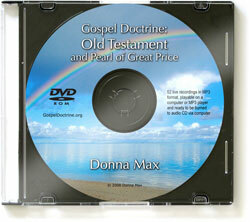 Gain new understanding of the Old Testament with Donna Max. 52 live, one hour recordings included (also available separately). Originally aired on KSRR in Utah, these weekly lessons have changed lives and strengthened testimonies. All 52 one hour lessons for the Old Testament are included on one disc in MP3 format. 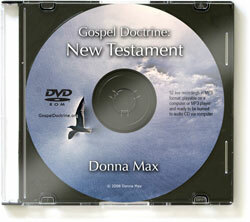 Join Donna Max in a comprehensive study of the New Testament. Originally aired on KSRR in Utah, these weekly lessons have changed lives and strengthened testimonies. All 52 one hour lessons for the New Testament are included on one disc in MP3 format. 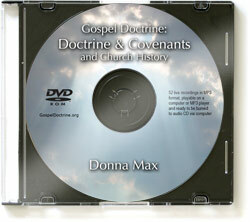 Donna Max takes an in-depth look at the Doctrine and Covenants and the events surrounding its coming forth. Originally aired on KSRR in Utah, these weekly lessons have changed lives and strengthened testimonies. All 52 one hour lessons for the Doctrine and Covenants and Church History are included on one disc in MP3 format. Donna Max shares her research and insight into the Book of Mormon. Originally aired on KSRR in Utah, these weekly lessons have changed lives and strengthened testimonies. 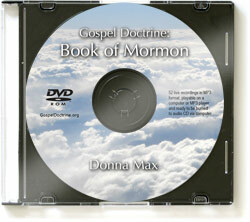 All 53 one hour lessons for the Book of Mormon are included on one disc in MP3 format.